Mr A saying thank-you to the Green Man for all the trees. So the weather has still been a bit hit and miss here in South Wales but we have had a few patches of glorious sun and tried to make the most of those moments. 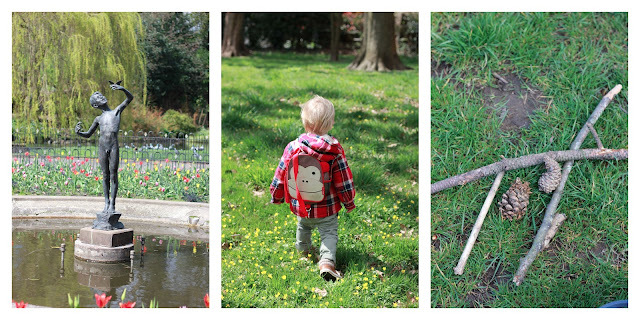 Since we are on the look out for our next new home, me and the little man have started to explore parks and outdoor areas we have driven past many times but never stopped to have a better look and learn more about the surrounding area. 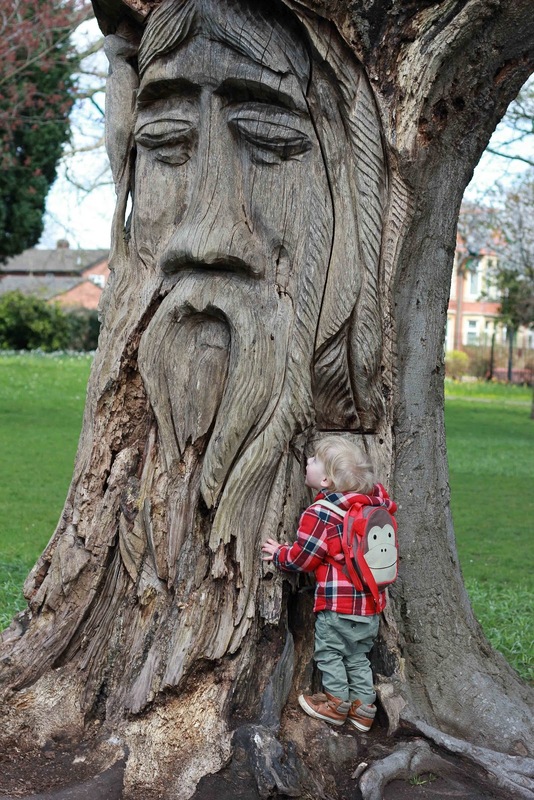 This week we decided to have a good wander around the small but beautiful formed Thompson park in Canton - a lovely little place with a duck pond, wild flowers and some wonderful wooded areas and a lovely green man carving in an old tree. Mr A found a "perfect for toddlers" tree to climb in and called it his castle, I was relegated to a tree stump as my castle but we had a great fun. I feel that it's very important for Mr A to realise that nature needs to be looked after and respected, he did me proud but pointing out some litter under a tree root and said "naught people put that there", so of course we picked it up and put it in the bin, we also then walked over to the Green man carving and said thank-you to him for all the beautiful trees in the park, learning to be grateful is a great thing to pass down to your children. We collected some sticks and pinecones for our nature table at home and had fun running through the daffodils and playing hide and seek behind the beautiful oak trees in the field joining the park. There is a real sense of calm about this park, well before the schools break up and then it fills with laughter of kids throwing bread to the ducks. Before this though we enjoyed sitting under a tree and having an impromptu picnic and then running under a cherry blossom tree. 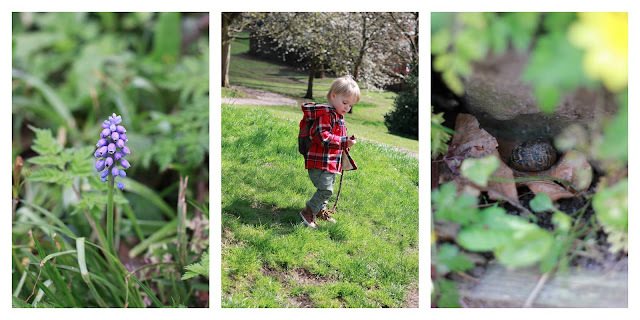 We also came across a little snail in an old wall and M A collected some flowers and leaves to give him to make him happy. 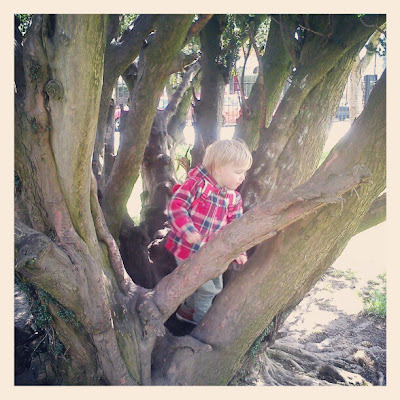 There were so many birds in the trees and we sat listening to their songs and Mr A loved trying to spot them up in the branches. Even though the park was quite small we had tones of fun as it really is so beautiful and filled with little magical corners. 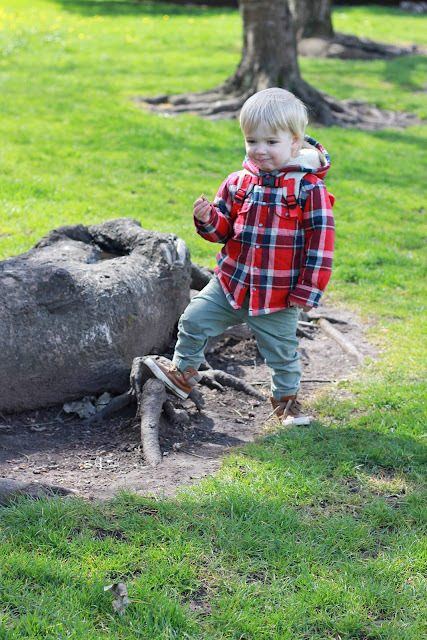 Every week we join up with Country Kids over on Coombe Mill blog and it's wonderful seeing everyones adventures, so why not join up in the linky as well. An amazing Green Man, he is so skillfully carved, I wonder just how many children do go up and talk to him? I love this park, it looks so beatiful, the sort of place to make your own fun. Thank you for sharing on Country Kids. What a fantastic tree carving! I also impress upon my kids how being a litter bug is naughty. Sounds lovely. Toddlers don't need much to make them happy. I love his castle! Love the green man and what a stylish little chap you have there.